If somebody had told me a week ago that I would soon be spending over 24 hours in bed, I probably would have laughed and then possibly rather liked the idea of some much needed down-time. However, in reality I picked up some kind of nasty virus towards the end of last week, which left me totally incapacitated. Far from being fun or extravagant, those 24 hours in bed were painful, boring and very frustrating. On the plus-side, there was something slightly liberating about surrendering my body and mind over to complete rest, and this gave me plenty of time for reflection. In short, I think I burned out which made me susceptible to any old germs that were going - lesson learned (the hard way). I'm feeling more human again now and it's a great buzz to be back with you, albeit at a slightly slower pace, but then we could all probably benefit from downshifting a gear or two every now and again, couldn't we? 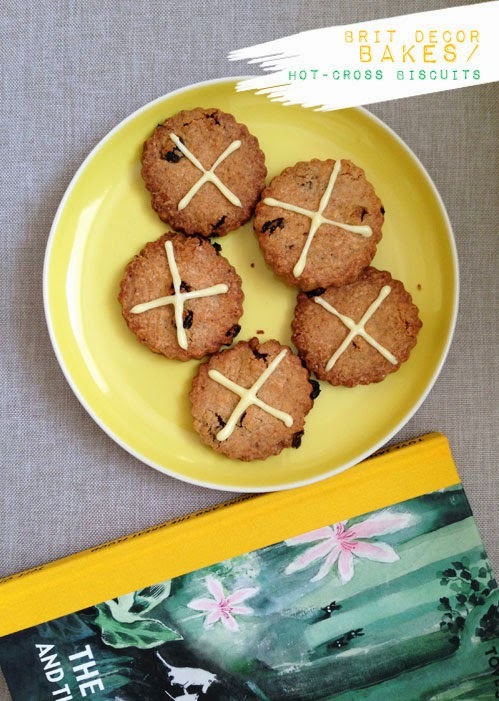 I am now focussed on the approach to the Easter break - that great half way marker between Christmas and the Summer, so in the spirit of that Spring holiday feeling, I couldn't resist cooking up these hot-cross biscuits for you - a traditional favourite with a crunchy twist! 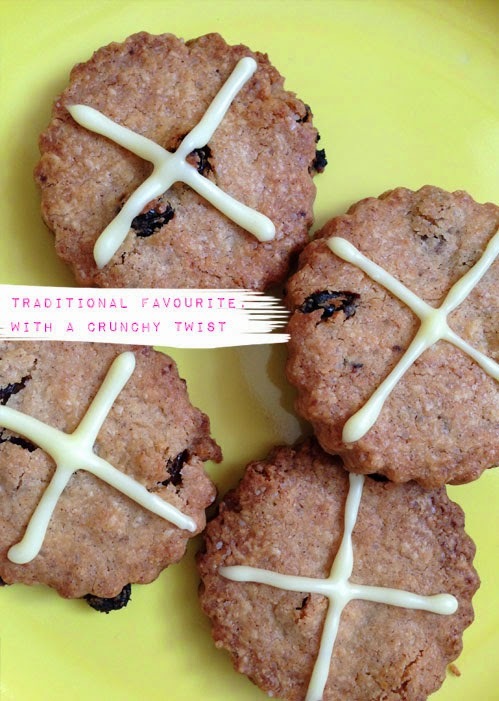 These have all the exciting spicy taste of the bun version but in a biscuity format - and delivered in a lot less time, which will leave you a little bit more 'me' time. Start by preheating your oven to 200oc and lining two baking trays with greaseproof paper. Add the butter and sugar to a bowl and mix together. Now throw in the egg yolk (keeping the white to one side) and mix well before adding the spices (Mmm love that smell), flour, and the cornflour. Mix in the currents and the lemon zest - your mixture should be taking on a dough-like consistency but if it feels a little dry at this point, add a tiny drop of the egg white. Roll the dough out onto a lightly floured surface to a thickness of no more than 1cm and use the cookie cutter to cut-out your biscuits. Lay these onto the trays and use the remaining egg white to lightly glaze the tops of the biscuits. Pop into the oven and bake for 10-12 minutes before removing again to cool on a wire rack. Now mix together the icing sugar and the lemon juice before piping the mixture onto the fully cooled biscuits - if you don't have a piping bag to hand, just drizzle the icing from a teaspoon, there's more fun in imperfection! 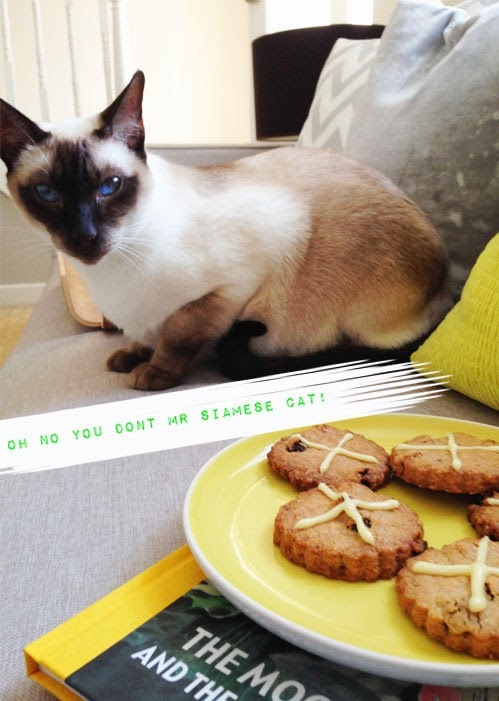 So on that note, I wish you all a very happy, very chilled, Easter break.